As a Premier Google Partner, we’ve proven the golden standard in Google Ads expertise and performance. One on one Google Ads Training delivered in Northern Ireland on your premises or at ours, tailored to your account. We are fully Google Analytics Certified, offering you better insight. Testing variations and applying the best. We’ll assess potential for improvement in line with your goals and provide a quote to get started. We are a multi-award winning Digital Advertising Agency. We work with you to achieve the best possible results from Google Ads, in line with your goals. We repeatedly beat targets and surpass performance of previous agencies. Just check out our testimonials. Our performance has been acknowledged by Google, shortlisting us among the best AdWords agencies in all of EMEA at growing businesses online. 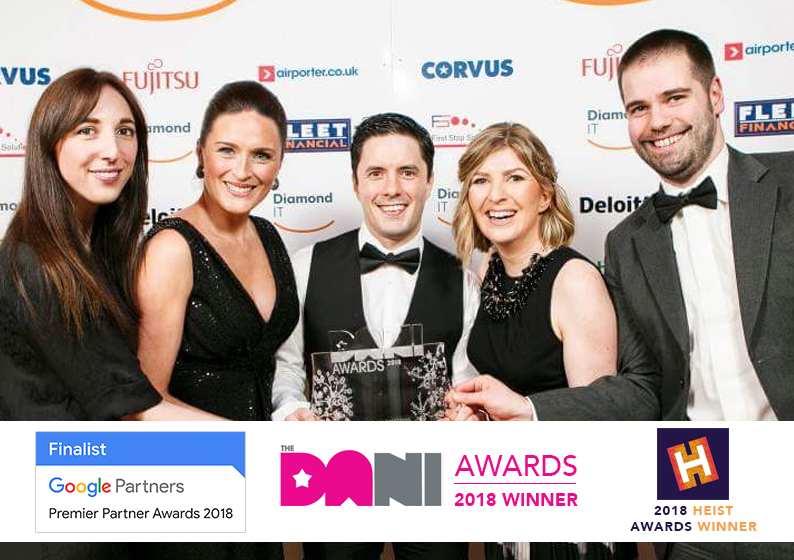 We’ve also won Best Digital Advertising Campaign and Best Campaign in Education at the 2018 DANI Awards, as well as winning the Best Undergraduate Student Recruitment campaign with Queen’s University, Belfast at the 2018 Heist Awards. Search Scientist was founded by a former Google employee, who’s among the very first in the world to be AdWords Certified, before the exam was even made public! Search Scientist is a Premier Google Partner and fully Google Analytics Qualified. We’re based in Belfast, Northern Ireland and work with businesses throughout the UK, Ireland and further afield. Interested? Enquire below. 51 Malone Road, Belfast, BT9 6RY, Northern Ireland. Call Us on: 028 90 683790.